The Hempstead Intersection Street former MGP is located in the Villages of Hempstead and Garden City, New York. The site spans the village line, and is located along the south side of Second Street in Garden City. The site borders Cedar Valley Avenue, an undeveloped “paper” street, to the west, and a non-operating LIRR right-of-way property to the east. Intersection Street in Hempstead Village helps to form the southern property boundary and it provides access to the Site. The site property is presently owned by National Grid, and the only operations at the site are conducted by National Grid for its gas operations (gas regulator station). An MGP began operation at the Hempstead - Intersection Street site in the early 1900s under the ownership of the Nassau and Suffolk Lighting Company. The plant was also owned and operated by the Hempstead Gas Light Company prior to merging with LILCO. LILCO operated the plant through the early-1950s. Following the arrival of interstate natural gas through pipelines in the northeast, the Hempstead plant served only as a peaking/emergency facility to ensure gas supplies and was subsequently shut down in the mid-1950s. The plant was demolished in the mid-1950s by LILCO. In 1998, KeySpan Corporation acquired most of the former plant property from its predecessor company, LILCO. KeySpan was acquired by National Grid in 2007. An adjoining 0.8-acre property to the south, which was a part of the former plant facility, was repurchased by National Grid in 2008. This 0.8 acre property was previously sold by LILCO (a National Grid predecessor company) in the early 1980’s, and used for the storage of new cars. Records indicate that the plant manufactured carbureted water gas for much of its operating life. 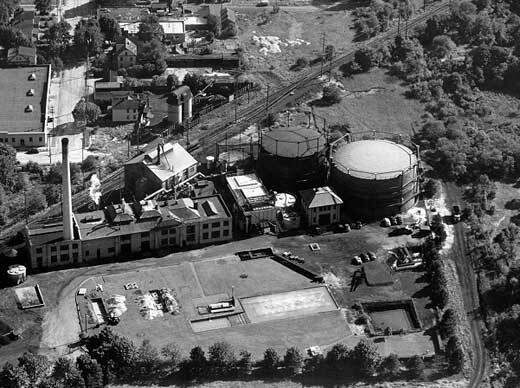 Gas was produced at the Hempstead plant to supply areas of central Nassau County from Garden City to Freeport and East Rockaway. The plant operations began in the southern portion of the original plant property and expanded to the north as the demand for gas increased. While MGP operations ended at the site more than 40 years ago, the Hempstead site still bears the residues associated with such operations. The Remedial Investigation, conducted under the oversight of the New York State Department of Environmental Conservation, determined the presence of potentially hazardous materials on the site associated with former MGP operations; and some of these materials are found offsite in a dissolved phase groundwater plume that moves in a south-southwesterly direction from the site. The chemicals include volatile aromatic hydrocarbons such as benzene, toluene, ethylbenzene and xylenes (BTEX) and Polycyclic Aromatic Hydrocarbons (PAHs). Extensive testing performed to date does not show Site related impacts to drinking water supplies, or any Site related indoor air concerns. The Site is fenced and secured to prevent unauthorized access to the site and to prevent people from being injured during the remedial construction.